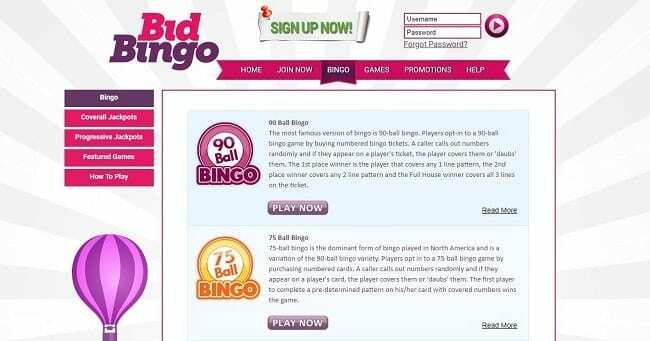 As any Bid Bingo review will tell you, this site and brand has been on the online gaming scene for a few years now and it has undergone some changes which many believe to have been very worthwhile. They have a great offer at the moment where you can get a £50 bonus and 25 free bonus spins. Having previously been registered through IGT’s own software, the bingo, gaming and casino platform has since been ported over to the sturdy and reliable Dragonfish bingo software and network, meaning that you can at least be guaranteed of a good time across the board. The mobile games here are smooth, speedy and fully inclusive, meaning that if you want to get stuck into the site and its games catalogue from your phone as opposed to from your laptop or PC, you can feel free to do so without worrying about missing out on any features or Bid Bingo promo code deals. We will, of course, get onto the site’s big deals very shortly! Anyone looking for a login or for more information on what makes the site tick will do well to read into further details beyond the opening deals and offers. While opening offers are always worth getting involved at a gaming site for, there’s often plenty more that you should be reading up on should you wish to join a new bingo site or slots platform. You need to consider terms and conditions, the games available and more besides and we’re here with a comprehensive Bid Bingo review to ensure that you go away with all the facts and nothing less. The welcome offer will give you a big bingo bonus, should you wish to throw in £10 of your own cash and be willing to take on a Bid Bingo promo code. You can presently enjoy 100% cash matching – that’s double your money – from anything deposited from £10 up to £50. Great news for anyone looking to make their money travel that little bit further. You’ll also receive 25 free spins for you to use on one of the big name games chosen by the site, this is subject to change, but titles such as Starburst slot have been plucked from the collection to offer free spins for new players previously. Of course, if you are interested in taking your winnings away, you’re going to need to consider wagering requirements. This means, on the back of receiving free credit, you will be expected to play back a certain amount of money before you will have the luxury of being able to withdraw. The site is very up front on these terms – you won’t even need to move away from the main page to see the main terms and conditions you need to know. Wager back 4x and you’ll be able to start cashing out winnings – and do be aware that bonus winnings can be capped at £2 on the back of any free spins you may be successful with. Other deals here certainly arrive thick and fast, and this is only a good thing – however, chances are if you’ve registered and played via Dragonfish elsewhere on the web such as Bingo Hearts, much of the regular deals and features are going to be very familiar. You may find the odd promo code around throughout your time playing on the site. While Dragonfish is a solid staple of internet gaming and is extremely reliable and fun to get into, there have been issues regarding originality over the years that can put certain serious gamers off. However, casual gamers needn’t worry – there are stacks of regular deals and events that you can dive into, such as the 2 Million Loyalty Points Race, the Late Night Show and more besides. Dragonfish sites do always guarantee a varied catalogue of great games, and everything on show here from the bingo rooms to the big name slot brands are easy to find and are fun to get into. Several different types of bingo await at Bid Bingo, along with scores of slot games and casino standards which will appeal to anyone looking for that Vegas experience on the go or at home. The site leads with popular titles such as Starburst, Kronos, Fluffy Favourites and Shopping Spree, you’ll need to register and sign in to get a good look at everything available, unfortunately, but there is at least a good look at what you could be playing should you register your details. Dragonfish sites have come a long way in just a short space of time and it is therefore slightly odd to see a site lead with what appears to be the older version of the software for displaying their features. While the games catalogue and even the standard promotions have been expanded significantly to compete with the wider market, we think the latest version of the engine, or at least a partnership with another developer, could help to lift the games into the stratosphere. Many people who have played on Bid Bingo sister sites such as Real Deal Bingo may not find much new to write home about here – though the chance to play your favourite games with a stack of promo codes should never be passed up. Dragonfish is great software to base a gaming site on and there’s plenty of interesting and fun games from decent developers which helps to make this site well worthy of a visit. The software used here, as mentioned, appears to be an older, less feature-rich version of Dragonfish that we’ve seen elsewhere online – meaning that some people may find navigating, exploring and launching games a little bit on the dated side. While the site and features do load up quickly particularly on mobile with your Bid Bingo login, there have been issues with standard browsers during our testing that suggest a move to a more advanced version of Dragonfish could be beneficial. Regardless – this software always brings the best out in bingo games on mobile – and you do at least have plenty of variety from games you have assuredly heard of time and time again. This is a nice cross-section of the most common banking methods players tend to be swaying towards, so there’s a good amount of inclusivity here. Withdrawal terms are fairly straightforward, you can cash out as little as £5 here, and you’ll generally see your money back with you within a few working days (though do allow up to a week). Do bear in mind that certain terms will also apply if you take on bonus codes and deals, meaning that, for example, the amount of money you can take away that exceeds the bonus received may be restricted. Certainly read up on all applicable terms, where possible, before you get started! Dragonfish certainly gets mobile gaming right and it’s great to see that this site pays attention to its portable players with a selection of big features that work just as well on the go as they do via PC and laptop. All you will ever need to do is visit the main website from your chosen device and browser and enter in your Bid Bingo login. From here, your device and chosen browser will allow the site to morph to benefit you – meaning that you’ll be able to play smooth and speedy games on the go without clunky navigational controls nor the extensive waiting time. There’s no official Bid Bingo mobile app waiting for you just yet – but the mobile platform should more than satisfy if portable play is high on your list of priorities. Check out the Glossy Bingo review to see another site with mobile features. After completing our Bid Bingo review, we feel it is a nice little site that makes the most of Dragonfish despite its leaning on an older model – certainly worth a look for the opening deals and the flexible mobile platform – this will appeal to casual players.